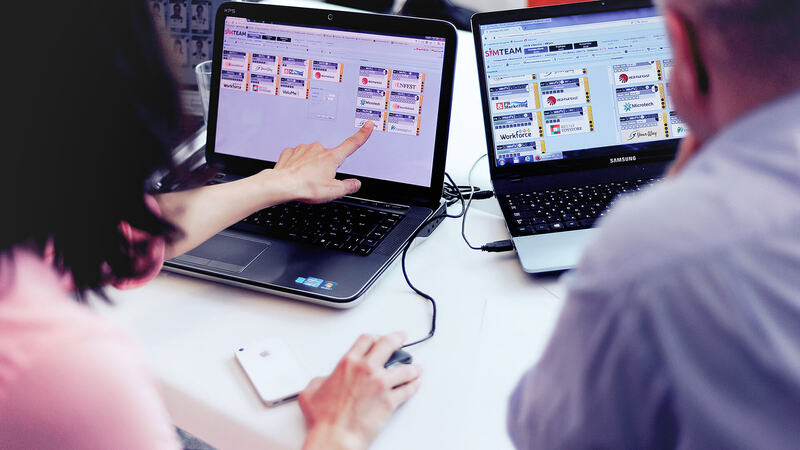 SimTeam software is a seriously fun web-based training tool for business trainings, education and teambuilding events. By using SimTeam, participants see how theory works in practice or how leadership decisions influence a company’s fate, all this through a web browser. During the simulation the participants form teams and manage project based companies. SimTeam runs on every computer operating system, you only need a web browser and an active Internet connection. The simulation is both managed and played online as the platform is in the cloud. SimTeam provides engaging industry independent business management experiences that prepares for the real world of business. The simulation is not limited to the production industry, rather it is up to you how you use it. You can make the simulation easier or more difficult according to your training's specific needs. You can change market events, starting positions, interest rates and a bunch of other variables to make every simulation unique. The trainer of the simulation uses a live online control panel, therefore has the ability to easily create time-pressure for the participants or to give more time for certain tasks when it is necessary. Install market scenarios with one-click. Select from a variety according to your preferences and get in touch with us for customized market cases and simulation scenarios. SimTeam is a stimulating and engaging team exercise where collaboration, commitment, cooperation and intra-team communication is a must, and participants can convert personal skills into corporate tools and processes. Participants manage and complete projects in the virtual business environment. The simulation offers human resources and project portfolio management aspects. SimTeam is currently available in ten different languages, including: English, German, Russian, Estonian, Slovak, Serbian, Romanian, Polish, Turkish and Hungarian! Being a serious game the SimTeam business simulation provides an engaging but serious atmosphere throughout the whole session. Business related trainings or teambuilding. Extending courses with practice oriented exercises. Assessment Centre, Development Centre, Management trainings. Train for the real world of business acumen in a risk-free environment. Train-the-trainer programmes, online helpdesk, sales materials, training handouts, support documents, videos and many more. Our Client Area now includes over than 100 documents, dozens of videos, interactive tutorials and tests. These can help you get familiarized with the simulation. We always work on providing a clear picture of the simulation and of its possible uses, and we never stop trying to make it more user-friendly. Click here to contact us and ask for a free trial! *We don't like spam either! By subscribing to our newsletter you will get regular information on updates, new features and new market cases to bring out the most of your SIMTEAM experience! Navigate through the website with the following links, and learn more about SimTeam. HUNGARY, 1061 Budapest, Liszt Ferenc tér 11. UPDATE! We have a new online simulation in our portfolio, click here to visit edu-simulation.com, home of our new product.